So, what is freekeh, you ask? Well, freekeh is a grain that I think looks a little like spelt. “Young roasted green wheat is harvested while still young and green, then parched, roasted and dried. The process captures and retains the grains at the state of peak taste and nutrition.” And besides that, it’s just a really tasty whole grain and a healthier replacement for rice (or even pasta). The cooking time is about what you would expect — 20-30 minutes. For the sake of experiment, I tried soaking it for 8 hours, while I was as work, before cooking and was able to then cook it in about 10 minutes (this was the cracked freekeh, but I’m sure that would work with the whole grain freekeh as well). When looking for inspiration for freekeh, I turned to one of the cookbooks that I usually look to first when I need some ideas on what to do with whole grains — Super Natural Cooking by Heidi Swanson. There, I found a recipe that originally used farro but turned out to be a wonderful dish with the freekeh replacement. Asparagus, walnuts green onions — it was all very Spring-ish. You could definitely keep it vegetarian but I really liked the added albacore tuna in this dish. 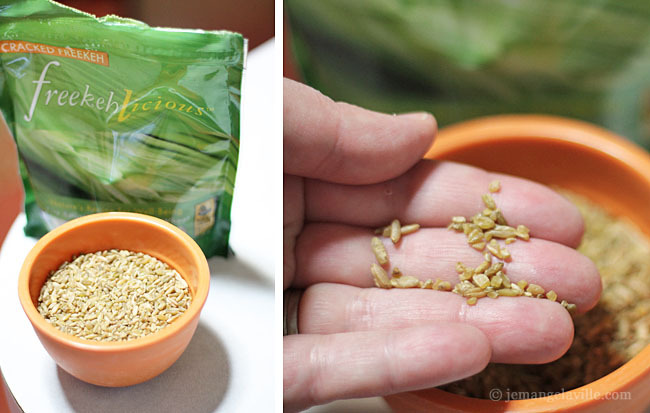 If you don’t have any freekeh (but you really should get some and try it!) you could definitely make this dish with farro, quinoa, or even brown rice. Just use the appropriate amount of vegetable broth for the grain you are using. Would you like to win some freekeh to try out for yourself? Well, just leave a comment by noon PST on Sunday, April 21st and I will randomly pick one winner and that person will receive two packages of Freekehlicious Freekeh! Very exciting! 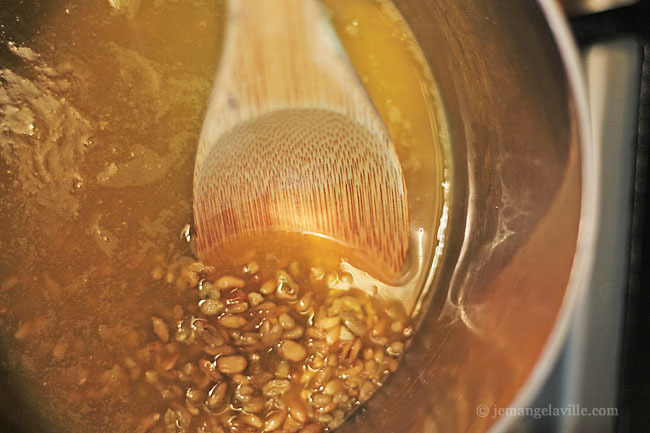 Combine the freekeh and broth in a large pot. Bring to a boil, reduce heat and simmer for 20 – 30 minutes. 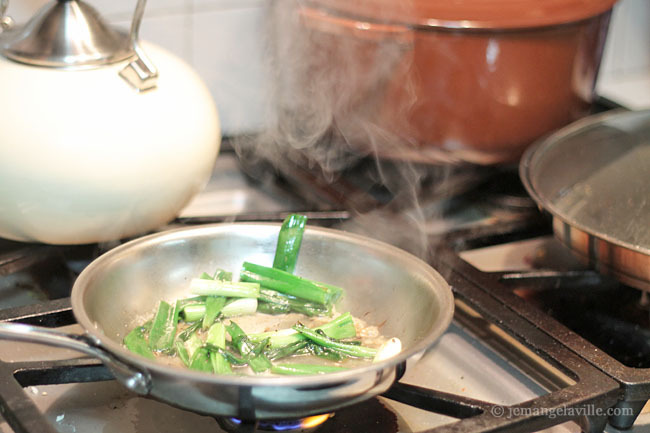 Heat the olive oil in a skillet over medium-high heat, then add the chopped green onions, garlic and a pinch of salt. Saute for 5 minutes, or until the onions start to soften. Add to a food processor or blender and pulse until lightly chopped/pureed into a chunky sauce. Set aside. While the freekeh is cooking, heat a skillet over medium high heat and add the remaining olive oil. Salt and pepper the tuna liberally on each side and cook for 2-4 minutes per side, depending on desired doneness. Set aside on a plate, covered with foil until ready to serve. 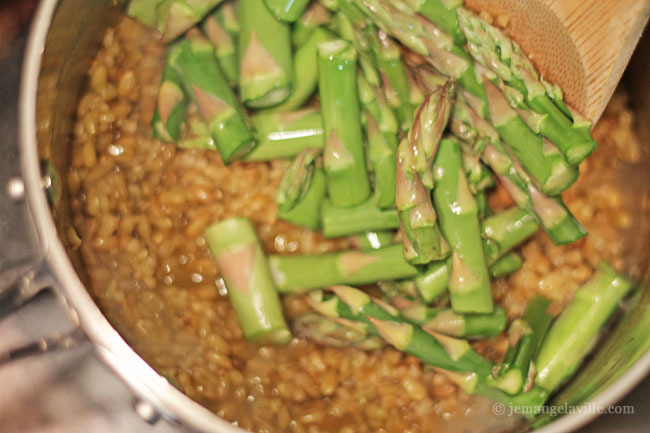 When the freekeh is nearly cooked, stir in the asparagus. 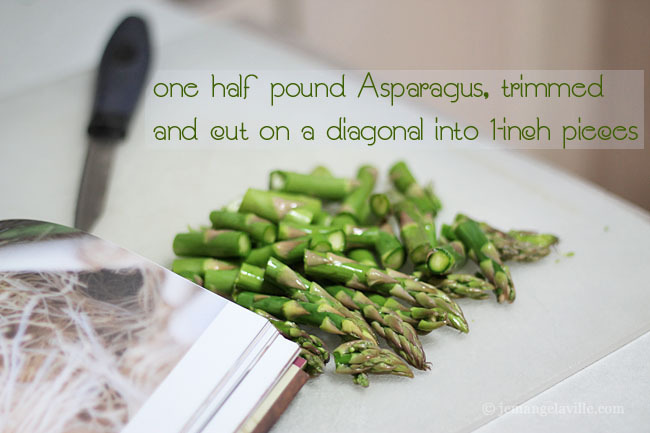 Let it simmer for another 2-3 minutes, until the asparagus is a bright green. Stir in the lemon zest, walnuts, and 1/4 teaspoon salt and a little black pepper. Taste and adjust seasoning if needed. 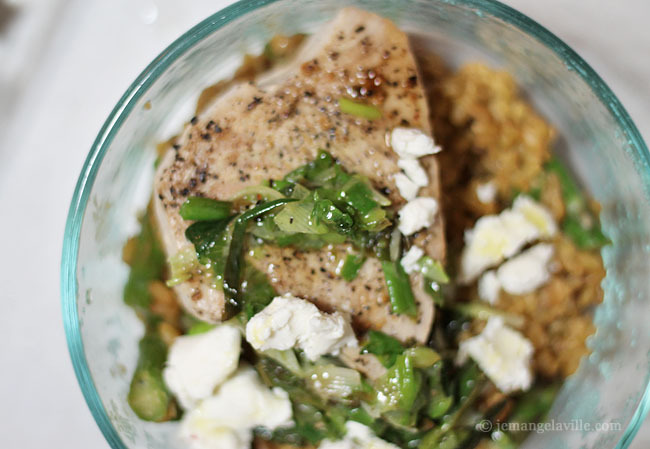 To plate: Dish up freekeh and asparagus onto two plates, cover each with a piece of tuna, then some green onion sauce and a sprinkle of feta cheese. I’d love to win a prize! The first time I tried Freekeh was at Pasta Pomodoro. I normally order two side dishes as my dinner at Pasta Pomodoro. Freekeh is not a regular item on their menu, but I always order it when they do have it. I love it. The grain is slightly chewy and nutty. Freekah has not been on Pasta Pomodoro’s menu lately so since then, I’ve been looking for Freekeh, but not successful at finding it. Now I know where I can get it! I’d love to try this! I’d never heard of it! I have heard of this but never tried it. Love it’s name! Also hard to come by in this part of the boondocks so I’d love you to send me some. I read about freekeh a few weeks ago, but this is the first i’ve seen a recipe. Looks awesome.